26/10/2017: 5 babies, day 23 of the gestation period (6 born, 5 surviving). LOX is a fantastic all-round great doe. I love her temperament - she has a calm confidence and is great with other rats. She loves a fuss and a kiss but doesn't want to sit around for too long when there is a world to explore! She is a beautiful girl with a very rich agouti colour and really nice robust type. Batarang is younger than I normally use my bucks, but the sendai virus last year and the fact that I tend to have doe-heavy litters has meant that we are a little short on buck options. Batarang is amazing, very much like his dad Batman in looks and temperament. 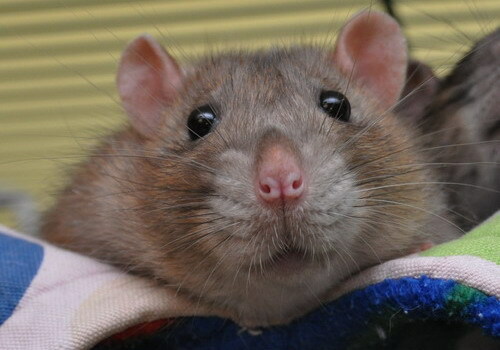 He is one of those rats I've never had a problem with, he always gets along with cagemates and is predictable in the very best sense of the word, always kind and calm. He is broadening out to become a lovely stud buck and has very good type, head and eyes. This is very much a type mating and I'm super excited to see what the kittens will be like. We are expecting agouti and black, with a small possibility of dumbo. This litter will be homed jointly with the Alfrees and Zookarus, and the closely related Biddys at Isamu. I plan to keep two does and two bucks in total, with the remainder being homed to our waiting list. If you are interested in going on the list for future litters, please see the Homing page for more information.